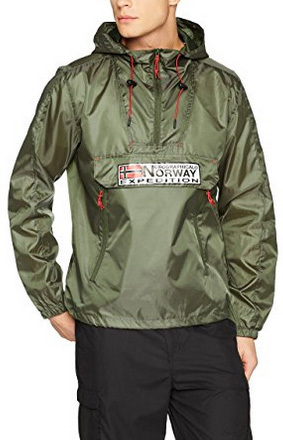 Welcome back everyone in today’s article, in which we will be taking a look at Geographical Norway’s recent jackets. These new arrivals have just been released and let us tell you, they were worth the wait. 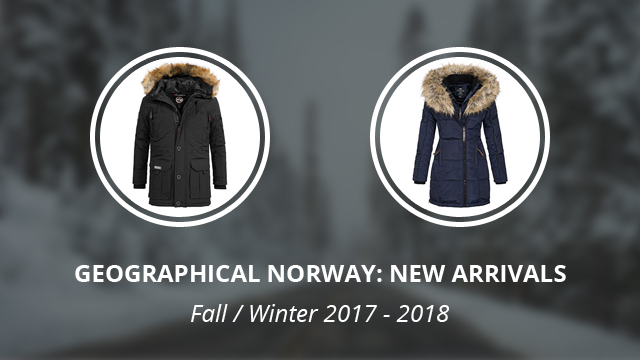 There will be 8 jackets featured in this selection, with options for both men and women, to give you a better look at some of the hottest products of this recent launch and give you options for this upcoming winter season 2017 – 2018. We went for versatility when picking out these jackets, including choices for fall, too. Time to get a better look at all we have selected and first up is Booster, a winter parka for men. The outer shell is made of 100% Nylon, while the inner lining and padding are made of 100% Polyester. 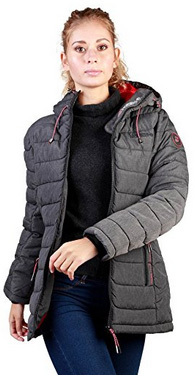 This fashionable jacket is a great option for everyday wear, as well as for more challenging activities, such as outdoor camping in the colder months. It comes with a hooded collar, which is adjustable and closes in the front by the main zipper, as well as a storm placket. The hood is lined with artificial fur trim, to protect the face and add some style to the design. There are four oversized pockets on the outside, including one on the left sleeve, as well as the ones inside. 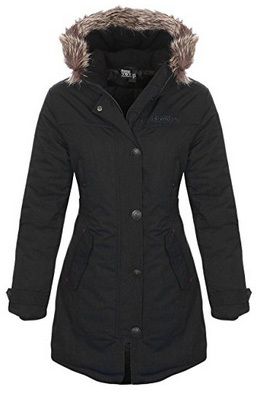 This is a heavy insulated jacket, with elastic sleeve cuffs and an adjustable waist. It is also water-resistant and is available in the colors: Black, Navy and Red. A fall jacket for active men, Choupa functions as a rain cover. It comes with a hooded collar, which can be worn either open or zipped up, depending on the weather. The hood is adjustable with drawstrings and it is specially designed to prevent rain dripping down the face. This is done by the longer front, which prevents that. There are two side pockets on the jacket and one in the front, all three oversized. Both cuffs, as well as the lower hem are elasticized for a better fit and to provide further insulation. The material is 100% Polyester and ultra lightweight, as well as being waterproof. It wears from the top, resembling a hoodie and it comes in the color Khaki Green. 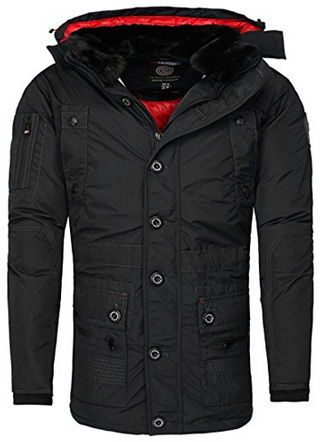 A very trendy and masculine design, Calcul is a casual jacket made of 100% Polyester. 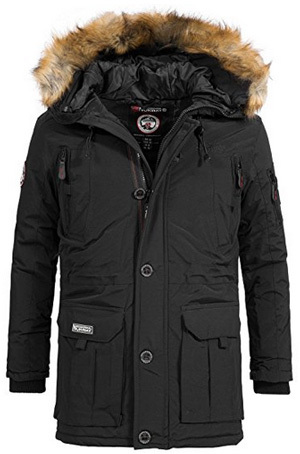 It comes with a removable hood, lined with faux fur trim in the color Black. The high collar helps protect the face and this jacket closes up by the main zipper, covered by a buttoned storm placket. The slim-fit design elegantly shows off the body, bringing attention to the width of the shoulders. There are two side pockets, two chest pockets and one right-sleeve pockets, along with inner pockets, providing plenty of room and flexibility in carrying your belongings. The sleeves narrow towards the wrists, where the elastic cuffs provide warmth and insulation. The waist is also adjustable with drawstrings placed inside and the color selection includes: Black and Beige. 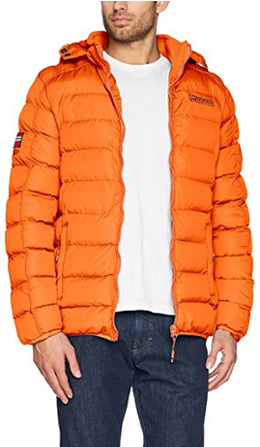 The fourth option for men is this vibrant and casual puffer jacket called Bellissimo. The hooded collar and elasticized cuffs and bottom hem provide protection and help further insulate the jacket against the cold. However the main responsibility for that belongs to the Polyester padding and horizontal quilting. This combination prevents performance loss in heavy rainfall and evenly distributes the padding, with no blind spots. There are two side pockets on the outside of the jacket and it zips up with a water-resistant zipper. It is available in the color Mandarine, a vibrant Orange shade, for those who enjoy some color in their wardrobe. On to the women’s choices and we will be starting with a parka as well. This elegant and feminine design is called Bellissima, which means “beautiful” and rightly so. The material is 100% Polyester through and through, including the padding, which is distributed by rectangular quilting all over the jacket, including the sleeves. It is designed for harsh winters and freezing temperatures, with wind and water-repellent abilities. The hooded collar, lined with a thick and fluffy faux fur trim, along with the cut waist, create a lovely silhouette. The back is banded and the jacket comes with several zippers, two of which used for closing it in the front and one opening it from the side. The latter one helps with sitting down, so you won’t have to take the jacket off or be uncomfortable. There are two hand-warmer pockets on the outside and the sleeve cuffs are elastic and ribbed, while the elbows are reinforced. There are three colors to choose from: Black, Navy and Khaki. 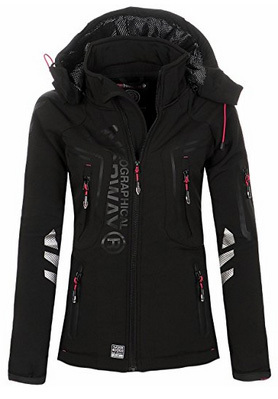 Also a parka, Davina performs beautifully in cold weather, but it is a tad lighter than the previous option. It comes with two outer pockets on the sides, two on the chest and one on the inside. 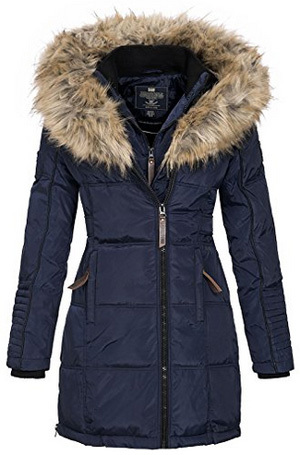 The hooded collar is also lined with faux fur trim, which is not detachable. This will help protect your face in cold winds and should you be caught in a blizzard. The waist is adjustable, as are the sleeve cuffs. It is a long jacket, with an elegantly curved bottom hem and available in the color: Black, Dark blue and Red. Including a sportive option for the ladies was a must, so we picked Vaasai, a high-performance softshell. This heat-insulated jacket comes with a high, stand-up collar and a removable hood, that can be adjusted using drawstrings. It is a highly water-resistant and windproof jacket, and being a softshell, highly breathable as well. There are two side pockets for the hands, two chest pockets and one sleeve pocket on the outside, as well as one inner pocket. This design is intended for a variety of activities and it is a great choice for layering when skiing or for when temperatures drop too low. A special feature are the reflective strips on the sleeves and body, which will keep you safe in bad weather and dim lighting. It is available in the color Black. Next is a hooded jacket made of 80% Polyester and 20% Nylon on the outside, and 100% Polyester on the inside. It is a quilted and lightly-padded jacket, with two outer and two inner pockets. The sleeve cuffs are ribbed and elasticized, while the hooded collar is adjustable in two levels: base and top, for a better fit and added protection. This is a casual jacket, designed for cold months but also breathable, if you are active throughout the day. It comes in the color Grey, with Pink and White details that really bring the whole design together.